Montblanc presents the Limited Writers Edition 2014 honoring Daniel Defoe (1660-1731). The novelist, pamphleteer and journalist, he was one of the founders of the English novel. He wrote Robinson Crusoe, one of the most widely published novels in English literature. The cap and barrel are made of precious resin with a wood grain pattern and ruthenium-plated fittings. The clip is made in the shape of a feather and the nib is engraved with a parrot honoring Crusoe*s loyal companion. 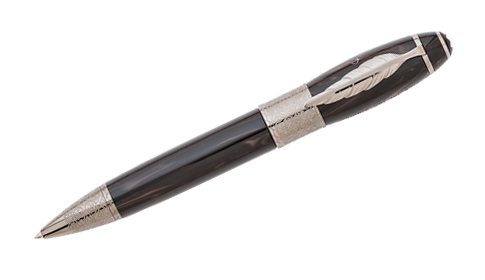 Defoe*s signature is engraved on the cap and the fountain pen is enhanced with an 18kt gold nib, available in M and F widths. Piston Fill.